It took a while to be able to admit, ‘yes I do a bit of writing,’ and then a little bit longer to say, ‘yes, I’m a Playwright.’ Capital P of course. I got my first writing credit in 2013 on a play called The Family Man with PatPat Theatre Company, a name I still love. We were a group of friends who’d met on an acting course at the Gaiety School in Dublin, and once the course was finished we wanted to put on our own production. We each had a part, we would meet roughly once a week and improvise scenes based on a broad idea of a family revelation once the patriarch has died. It was a great learning, great fun too. I took the writing credit because I had done the majority of the scripting, but it never felt like it was my writing, and I didn’t have the vocab to call it devising or dramaturgy. Because so much was just transcribing what had been improvised between us, and had been edited between myself and the director. And the idea itself wasn’t mine. The next experience would be the following year with Underfoot Theatre Company, again post drama school, a group of actors devising our own work simply so that we could perform and be seen. I wrote my own scene based on some original ideas and some wonderful evenings and afternoon improvising with my lovely co-star Aleks Grela. It was hard but it was fun and I learned even more, but again, I didn’t feel like a playwright just yet; I barely felt like an actor preening and pouting as I was on stage, but it seemed to work for the odd character I had created. In 2015 I discovered this thing called the Bruntwood Prize which was a godsend to my fragile little ego. Anonymity made it that little bit more exciting and accessible, as I didn’t have to provide any awkward self-promoting bio or exaggerating CV. All I had to do was come up with a decent pseudonym. I had been toying with an idea about an interview scenario of 2 women interviewing a man, though he thinks it’s for a job it turns out they’re looking for a sperm donor. I wrote the thing, got friends to read it, got actor friends to do a table read for me, and took all their feedback and redrafted. Though probably not enough. The real achievement at the time was getting all in on time. The idea never really felt finished. Suffice to say it didn’t place, but it did make me think, this is doable. So in the following years, I wrote short pieces from scratch nights and new writing nights, 3 of which were performed at BraveNewWord in 2016. 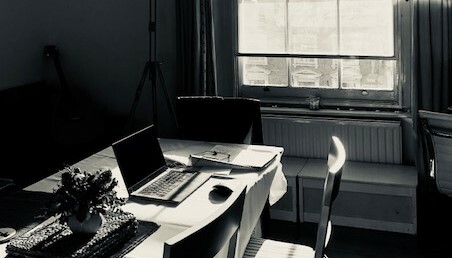 I went to workshops and courses advertised on London Playwrights Blog – an absolutely treasure of site for opportunities and advice. I wrote any and all ideas that came to me regardless of whether they might even make suitable plays. I wrote out the internal monologues I was having with my inner demon/deity – which eventually because A Girl and Her God. I was still a little stuck on the Interview play which just wouldn’t go away, so I tried to come at it from angle, taking some of the characters and putting them into a different configuration. I wrote a new draft, got some actors to read it, and got their feedback. ‘Lots going on, lots of politics, lots of themes.’ So I pared it back. I took things I had liked in the readthrough, little details in the performances that the actor brought to it, and reconfigured again, paring it back to a basic 3 person story. Her Not Him came out of that, a love triangle, an exploration of my own angst over coming out late in life, over motherhood and the possibility of never being one, over my confusing relationship history, and falling for someone I never really knew. So some time this year being able to say ‘Yes I’m a Playwright’ got a little easier given I had 2 plays on the go, that I was talking to directors and theatres about with complete seriousness. And I’m so inspired by the competition and that it draws people from so many different backgrounds and different levels of experience. Judged purely on the quality of the writing, not the postcode, the CV or anything. I’m dying to see some of the shows that come from the 2017 shortlist. And can’t wait to have another go at the title in 2019.